Analyzing large molecules may be one of the greatest challenges that the bioanalyst faces at the beginning of the 21st century. Employing LC-MS for the bioanalysis of large molecules requires the extraction of the target analyte from a matrix of biochemically similar peptides and proteins. However, we have seen that the most common techniques employed for small molecule extraction, such as protein precipitation (PPT) and liquid-liquid extraction (LLE), do not provide the recovery, sensitivity, specificity, and assay robustness required for large molecules. The LC parameters are very different than those used for small molecules. 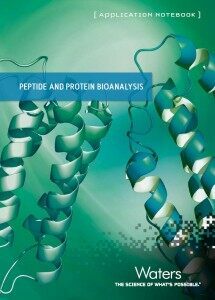 In a addition, writing a multiple reaction monitoring (MRM) method presents a unique set of considerations when working with peptides and proteins, including the presence of multiple precursors and a range of few to many lower abundance fragments. 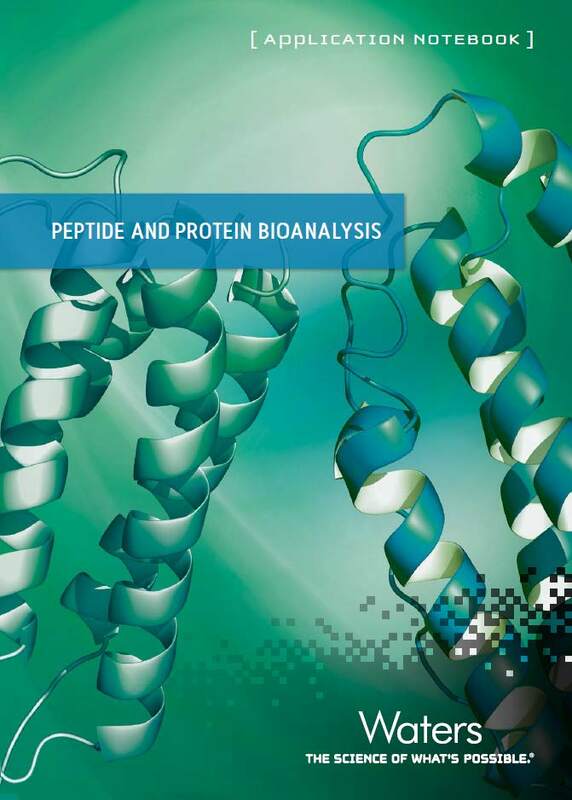 To support bioanalysts in their quantification of large molecules, Waters has created a new educational resource, the Peptide and Protein Bioanalysis Application Notebook. The compilation includes 21 application notes published between 2009-2014, organized into key areas: general best practices, endogenous analytes, therapeutics, and disease state. A tear-away infographic illustrates how and why large molecules must be treated differently than small molecules. The notebook also includes an index of more than 30 featured molecules, which link to the various app notes in which they appear. Waters® understands the subtleties within each parameter affecting the development of robust, reliable, high sensitivity bioanalytical assays for large molecules. In addition to the resources named above, we have developed sample preparation protocols and separation conditions that will help you quickly and effectively develop methods for any peptide or protein. We have also built our expertise into the LC-MS software to provide you the tools that will enable you to quickly make the transition from small molecule to peptide and protein bioanalysis.